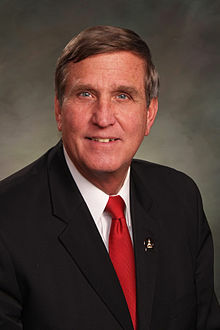 DENVER—Today, the Senate unanimously passed Senator John Cooke's (R-Greeley) guarding against the sexual trafficking of minors in Colorado. House Bill 17-1172 requires courts to adhere to the minimum sentencing of eight years in the Department of Corrections for those convicted of a class 2 felony for human trafficking of a minor for sexual servitude. In 2016, Colorado saw a 56 percent increase in the number of human trafficking cases from reported to the National Human Trafficking Hotline. Senator John Cooke is a former Sheriff of Weld County who worked as a persons crime investigator and focused his career on protecting Colorado's most vulnerable citizens from sexual assaults, rapes, and violent crimes. "Sexual crimes against children do not deserve our leniency," said Cooke. "This is simply one of the most disgusting and abhorrent crimes a person can commit. Children are innocent, and they depend on us for protection. The idea that we could let these truly terrible individuals back into our communities to reoffend is unacceptable. We have to protect children. This bill is a small but vitally important step in keeping more kids safe." HB 1172 now continues to the governors desk.